Where are explanatory variables from the previous time step. Challenge of this model is proper selection of explanatory variables. Of course, the non-trivial work is generating forecast estimates for next-step average conditional return and conditional variance . A survey of estimation techniques may be considered in a subsequent post, depending on reader interest. 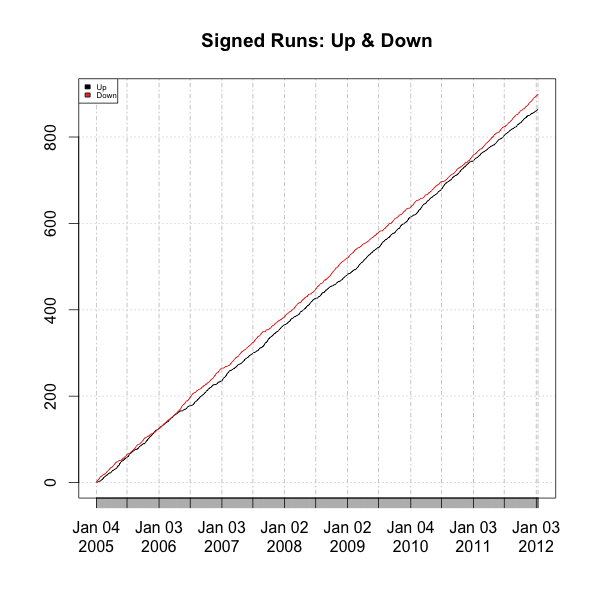 One exploratory analysis technique relevant to sign forecasting is visualizing up/down runs, signed difference (i.e. 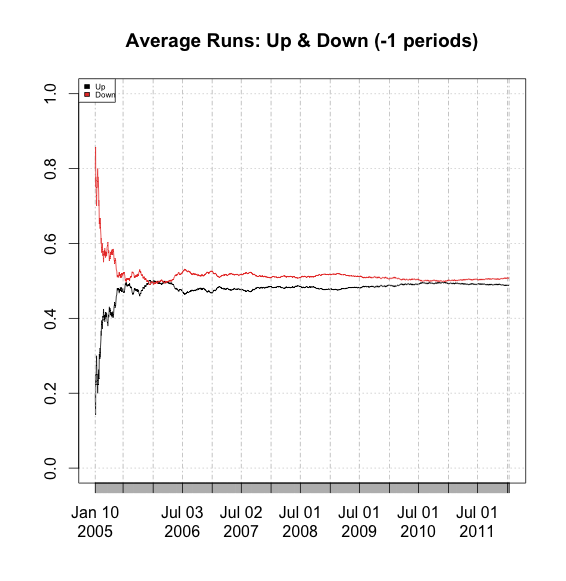 up-down), and corresponding averages for a return series. 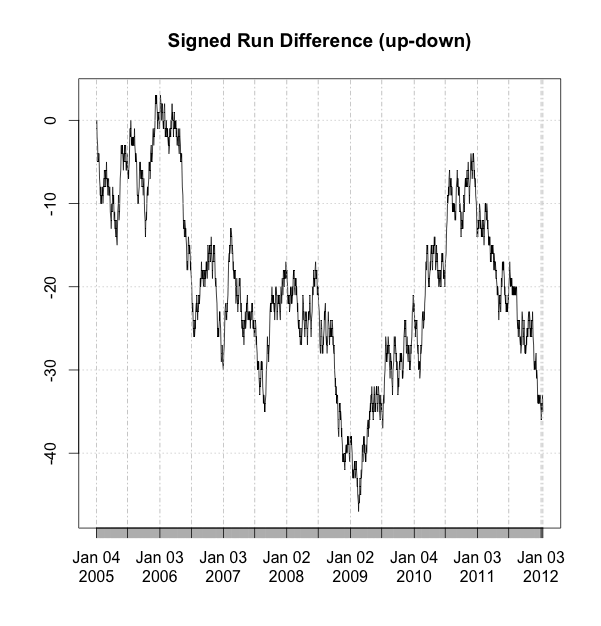 Finally, Kinlay briefly surveyed this topic in two posts on volatility sign prediction. ← Physics, Biology, or Peltzman? Excellent post. My research into direction of change forecasting has revolved around simpler, intuitive use of conditional probabilities based on volatility, LIBOR, etc (largely similar to Kinlay’s posts). Looking forward to delving into more advanced treatment of the subject via the papers you linked to. Would be very interested in any further treatment on this blog. @sethm: thanks for complement; in your research, do you find success with those explanatory variables; if so, curious for what types of equities? Thanks for paper reference. Volatility forecasting is a beautiful topic; my appetite for lit survey is only tempered by its massive scope. For equity, I have stuck to indices. Thus far I have been unable to reliably forecast volatility for individual stocks. I’ve found that the volatility of volatility of indices to be lower and thus more readily forecastable. Thanks for the post. Happened upon it after happening upon your blog. Looking into whether these methodologies would be useful for forecasting pairwise relative returns among asset classes over longer periods, e.g, ~4 weeks, for purposes of tilting allocation levels within an overall portfolio. Just delving in now and this is a great start. Please do keep it up, your site will definitely go onto my favorites. There has been lots of quantitative finance modeling and techniques available from books and on the net but most of them are focused on helping people to find a sell-side job in investment bank. This blog is very unique that it applies those techniques from retail investors perspective. I guess the sigma(t) is probably estimated by historical methods such as GARCH or EWMA or looking at the options IV, but how should the mu(t) be estimated? I have been looking at the HSI index in Hong Kong market and most of the time the student’s T test told me the daily mean return is zero. @plchung3: thanks for your kind comments. Re HSI mu: zero daily mean return is not surprising. Use of a longer sample duration is more likely to generate non-zero mean return, whose sign will depend on market regime(s) prevailing during estimation period. Logit estimation of mu is one approach, as mentioned above; other approaches exist (e.g. quantile estimation has shown promising results). Recall the literature has consistently demonstrated much higher accuracy in forecasting volatility (esp. conditional) than mean return (whether conditional or unconditional), hence many folks focus on volatility. Note this is the same rationale which motivates use of minimum variance portfolios.